Giveaway is now closed! thanks for all the comments, I love reading them and learning more about what quilters and sewers are doing. The Winner is Christy and she was notified by email. Thanks! It’s a great day for a fabric giveaway! Thanks for stopping by my little corner of the quilting world. If you are a regular reader, I thank you for the kind comments. 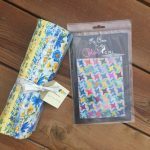 If you are visiting for the first time from the Sew Mama Sew giveaway day: I am glad you found me and I hope you will come back again soon. For my giveaway, I have seven prints from the brand new (and much anticipated) range by Jen Kingwell for Moda: Gardenvale. The light piece on the far right in the photo is a fat quarter, the other six are large fat eighths (around 12″ x 21″). 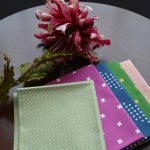 A good little bundle to get you started on your next sewing project. All you must do to earn a chance to win is leave a comment here on this post. Tell me your very favorite type of quilting project, for example: simple, fast patchwork, paper-piecing, curved piecing, applique or other handwork, etc. If you are not a quilter, what would you like to make with this fabric? Leave an optional second comment (and another chance to win) if you share a post or photo from my website on Facebook or Pinterest. My favorite it curved piecing! 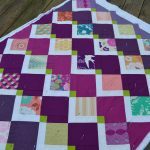 I love experimenting with different shapes and layouts that you can get with curved shapes in quilts. 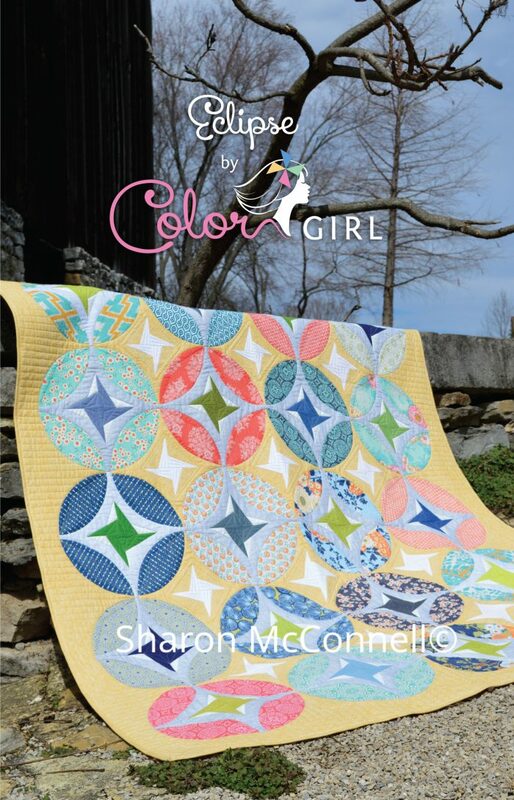 Above, Eclipse is my newest quilting pattern and I have just listed it in my shop in print form, so you can get it in print or pdf download. I just finished my first semester back at University (yea! ), so I am looking forward to sewing some new curvy quilts during the summer break! Right now I am into making traditional sampler blocks. I have been working with more modern versus traditional quilt patterns and designs. I would like to do more paper piecing in the future. I’ve only made one block with curved piecing but I really enjoyed it! I love designing and piecing. As a beginner I like working on simple quilts right now. However I do have a bucket list started and would like to challenge myself. I love simple patchwork quilts. I like simple patchwork the best. I would say my favorite is fast patchwork. I’ve made a few traditional blocks with teeny pieces and found it frustrating. I’d rather sew than cut and line up pieces! My favorite is fast patchwork, but I want to try paper piecing soon. scrap quilts were my first live and I still do love them. I love regular piecing and I love anything lap quilt or smaller.. baby quilts, home dec stuff.. I was just eyeing this collection 🙂 Thanks for the offer! I like foundation paper piecing for the exactness, but love applique as I like to do hand work a lot. My favorite type of quilting is something that challenges me. Fabric here in Germany is very expensive so it has to last me quite a while. I like to try patterns and techniques I’ve never done before and my quilts are always queen-sized. I love the precision of paper piecing. I’m mostly a big quilt quilter, lol. King sized. And lap sized I guess! My favorite is simple since i’m new at it. I’ve only completed one quilt and it was a pinwheel quilt. I like pre-cuts and fast piecing. The next project I have lined up is a quilt for my son using charms. Thanks! I like making quilted totes and small quilted pieces. HELLO,I’m working on spring-time table toppers this coming week for gifts! Thanks to you for a neat Giveaway! 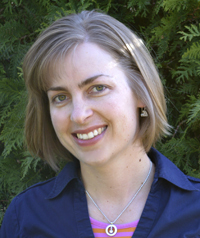 I love a project that can be completed quickly – I get discouraged by things that drag on and on. I can spend all day sewing, but really love to see that finished project when I’m done! 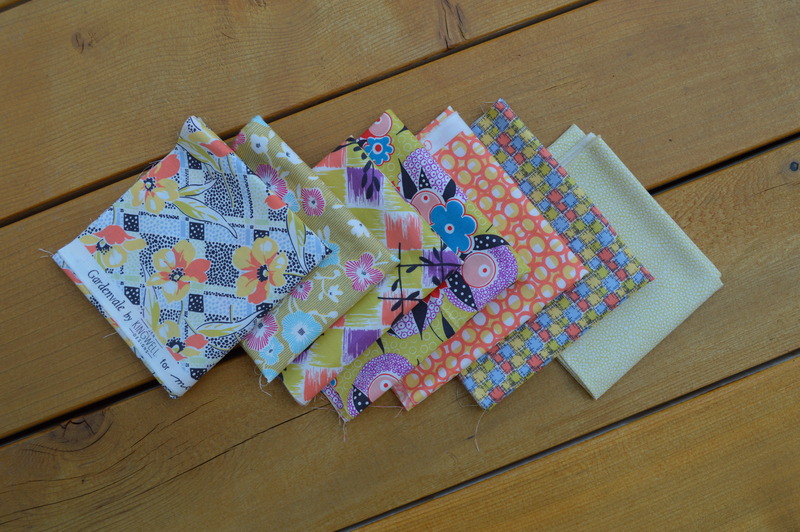 I enjoy paper-piecing and these fabrics would be a perfect addition to my stash. Thanks for the great giveaway! Lately I’ve been enjoying EPP, but I haven’t actually finished a project with it yet! I also shared your beautiful After the Rain quilt on Pinterest. I’m curlygirl575 there. Thank you so much for sharing w/me. I like mini quilts and applique. I am game on really anything because I love to quilt. My favorite thing is adding to a small size quilt and designing to make it a queen size using squares, rectangles or triangles with different sashing and borders.